In addition to making driving easier for motorists, the infotainment systems of the future will also boost traffic safety. Not far from Paris, in the city of Rambouillet, Siemens has introduced the latest trends in this field. Infotainment systems combine consumer electronics with electronic information systems and make both easier to use. Tomorrow’s motorists will view route information in video quality, and their travel directions will be displayed on their windshields. And there will be "car buddies" — drivers who will communicate with friends whose vehicles are nearby. 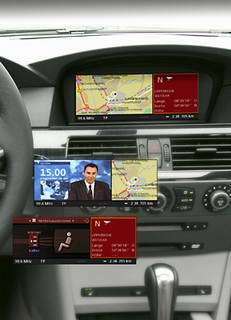 Developers from Siemens VDO Automotive have considered this solution, which would make it possible for drivers to arrange meetings: Just a small addition to an infotainment system’s hardware and software is all that’s needed to be able to create car buddies. Just as Internet-based messaging systems can notify users when their friends are simultaneously online, in the future it will be possible for motorists to call up the locations of their friends at any time — provided that the friends have given their permission. For the transportation professionals, a modified version of this technology is almost yesterday’s news: It’s already offered by Siemens in the form of tracking and tracing solutions for the management of freight transport fleets. In the passenger car of the future, the borders separating the virtual and real worlds will be much less distinct. The vehicle’s navigation monitor will display details of the surrounding landscape and sightseeing attractions in nearly photo-realistic images, and an integrated camera will continually film the area in front of the car. Computers will then incorporate the route information in the video imagery recorded by the camera. To do this, the computer compares the data for the recorded objects with the road information it has stored, and then superimposes the appropriate route on the video image. Plans call for this “augmented reality” process to be integrated into a head-up display; in other words, it will be projected onto the windshield. This will make it possible for the driver to continually monitor traffic situations, and that means safer driving. The Siemens innovations used won’t be limited to route planning: A car’s central infotainment control system will provide the motorist with the latest news, and during the drive home it can even send a message to the driver’s house — telling it to turn up the heat.